If you've spent any time at the Western Idaho Fair or other local festivals, then the name "Saladman" probably rings a bell. Chris was a longtime vendor at those sorts of events, turning out wraps, sandwiches, fried things, and of course, salads. Some of the more in-the-know people might recall that when he wasn't at the Fair, Chris had his shack set up in a few different places in Boise to serve the lunch crowd, the last of which was on State Street. Eventually he decided to give up the food truck/shack life for a brick and mortar restaurant called Chris' on Broadway (guess where that was located), but it wasn't long before location issues reared their ugly head and drove him to the other side of Boise. Chris finally landed in a strip at, of all places, Emerald and Maple Grove. I didn't hold high hopes for his success, seeing as how many restaurants have tried and failed in that strip. Somehow, he's been making it work so far, odd location and limited hours aside. The new spot is open only for breakfast and lunch, and only on weekdays. If you haven't caught up with Chris yet, here's some of what you've been missing. The somewhat deceptively named "Egg Sandwich"
For a long time, we've been told that breakfast is the most important meal of the day. 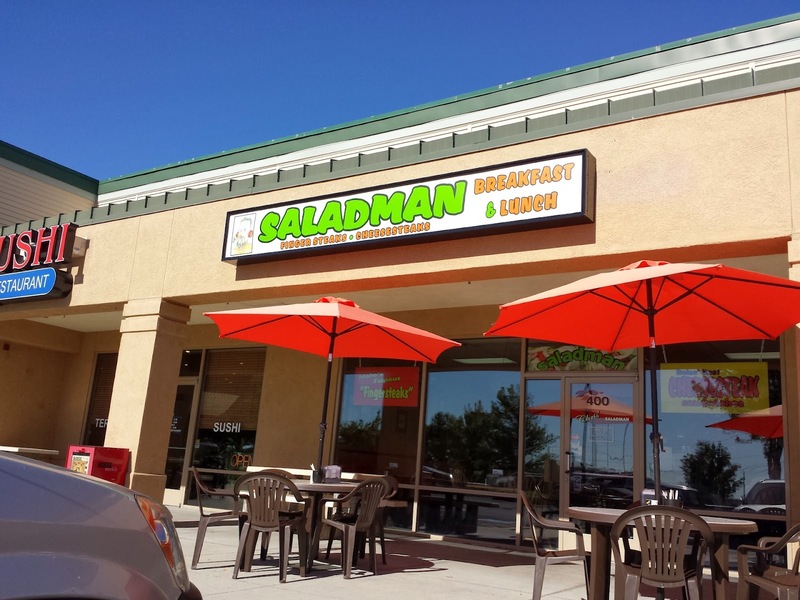 Have breakfast at Saladman though, and it might be the ONLY meal of the day. A co-worker and I decided to order that bad boy you see above one morning, and because we both have a fondness for bacon and evil sandwiches, we went all out with it. You see, the Egg Sandwich (scrambled egg, cheese, potatoes and meat of choice) comes in three sizes: 4" with two eggs, 6" with three eggs, and 8" with four eggs. We kind of dared each other to get the biggest size. The bread was decent enough, the eggs scrambled perfectly and neither too runny or too dry, the potatoes neither too crisp or too limp, and the cheese both generous and perfectly melted. The bacon wasn't quite as crisp as I would like...wait, let me clarify that. Two of the strips of bacon weren't quite as crisp as I would like. The other four were just fine. Ah, the finger steak. Southern Idaho's contribution to World cuisine. Or at least Northwest cuisine. Trust me, I never ran into anybody out East who has heard of these things. Fry sauce is also scarce out there. And they're vaguely horrified by the idea of dipping french fries in tartar sauce. But I digress. I'm old enough (barely) to remember eating finger steaks from the Torch Lounge, where nowadays there is nary a finger steak to be found (but plenty of girls dancing in bikinis, if that's your cup of tea). Since then I've eaten them at a lot of places, but nobody else's have quite hit the spot for me. Chris' are perfectly competent and come in "appetizer", half pound and pound servings, all with fries, and the two larger options with coleslaw as well. You will also of course get fry sauce and cocktail sauce. The meat is quality and hand-breaded, but not as strongly seasoned as I would personally like. I fully admit that I'm picky when it comes to this particular item though, and Saladman has a legion of fans who dig his version. Try it and judge for yourself. I suppose I would be remiss in reviewing Saladman without talking about a salad, and this is the one more than any other that gave the Saladman his moniker. 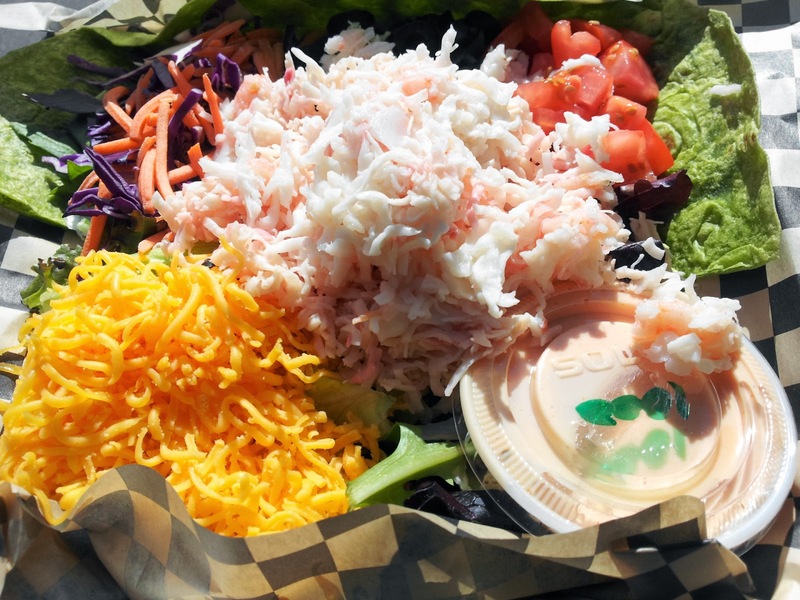 The Crab Louie, alternatively known as "the king of salads", has seen a few interpretive differences over the years. The Saladman version comes with shredded carrot, shredded purple cabbage, tomato, a big pile of shredded cheddar cheese, and an are-you-freaking-kidding-me big pile of shredded crab meat. And Thousand Island dressing. Oh, there's some lettuce underneath all of that. And half a spinach tortilla, because why not? More than anything else, this is the item that has brought me back to Saladman, and it's probably better for my long-term health that I no longer work ten minutes from the restaurant. There are other things available as well. I never have tried the cheesesteak, which Chris is also pretty well known for. Unbelievably, I've never tried his chicken fried bacon either (available as an appetizer, on a burger, or even as the centerpiece of a BLT). If I wanted to dig there might even be some healthier menu items available too such as other salads and wraps, but who am I kidding? This is not the place I go when I'm being good. Trust me, it's so much more fun that way.